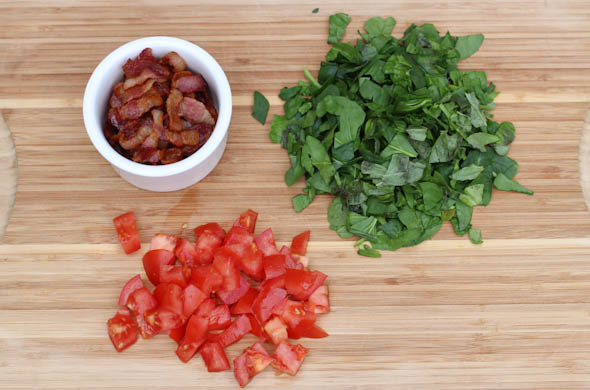 BLTs in all forms! 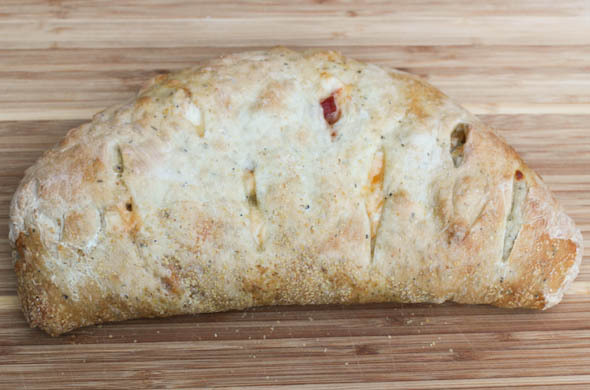 I put all my fav flavors into a calzone. 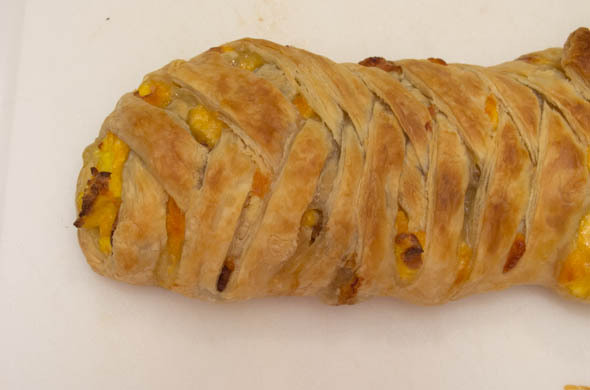 I prepped this on a weekend, let it cool, and wrapped it up, and it was ready to go during the week! I baked it a little less than usual and the night we were going to eat it, I popped it into the oven for about 15 minutes. Voila! 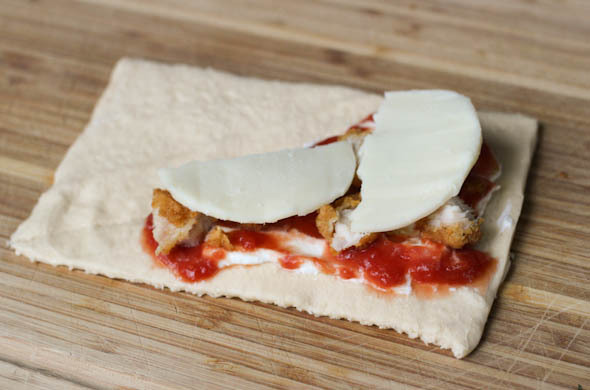 The little one is veryyy ready for dinner when we get home so this was such a great time saver. 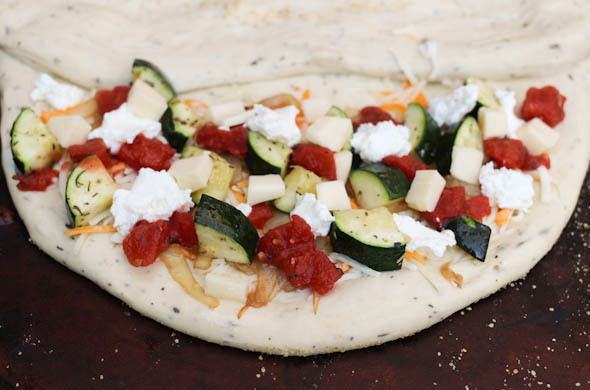 Preheat the oven to 400-degrees (and preheat the pizza stone, if using one). Pan fry the bacon until crisp, and drain on paper towel. 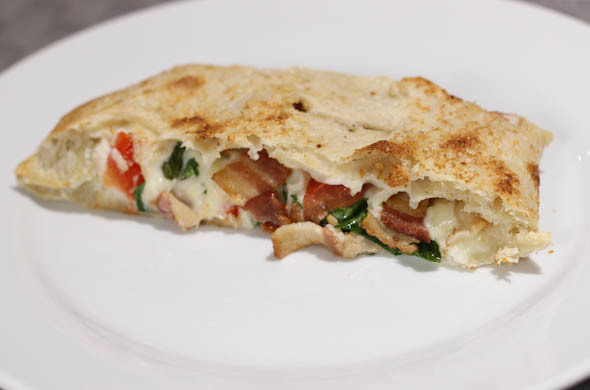 Chop the spinach, tomato, and bacon. 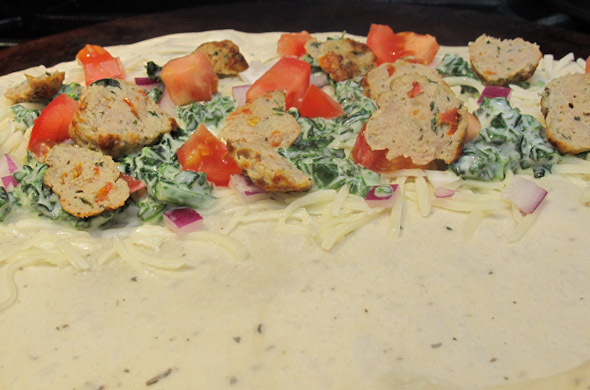 Sprinkle the cornmeal or wheat germ onto the baking sheet or pizza stone. 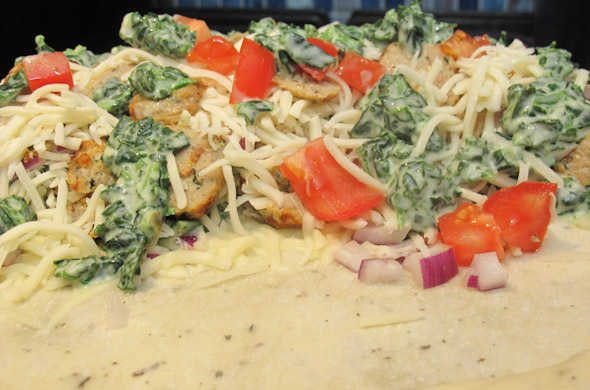 Layer on half the cheese, half the bacon, half the tomato, half the spinach. Repeat. 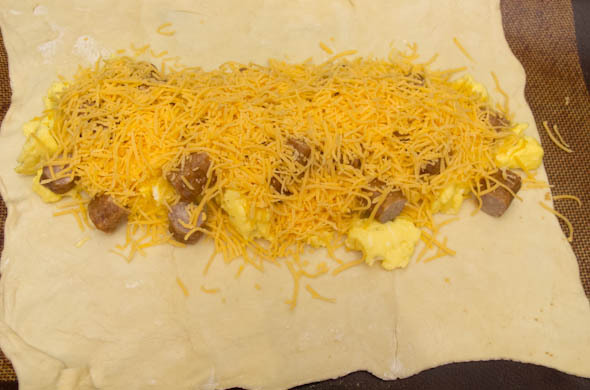 Pull the other half of the dough over the filling and pinch to close. Cut a few slits in the top to vent. 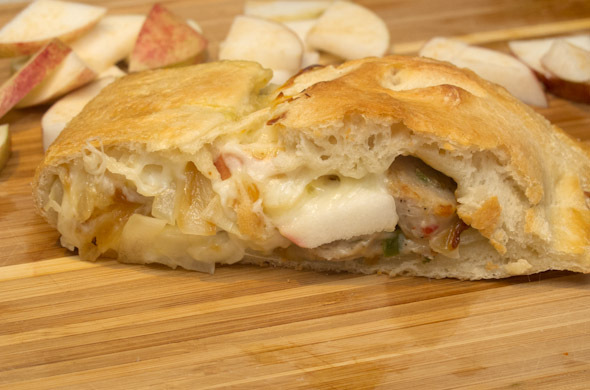 The beauty of this calzone is the classic combo of these few ingredients. 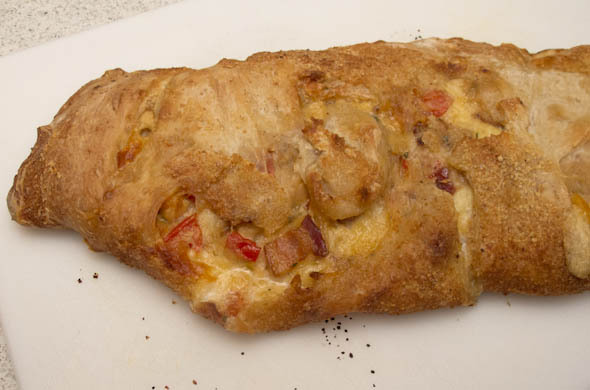 Calzones also make great leftovers so I was also in luck for lunch the next day too. 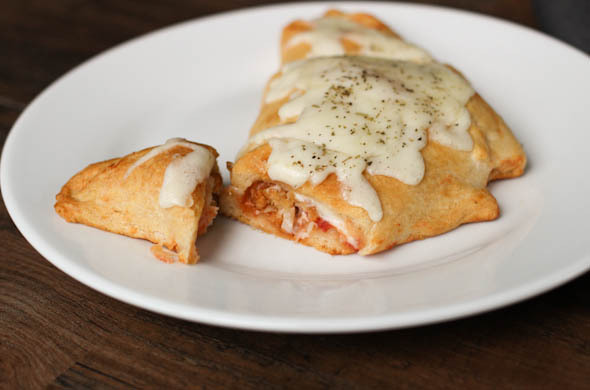 Calzones are also easy to make mini so this can be 1 big calzone or 4 individual serving ones! 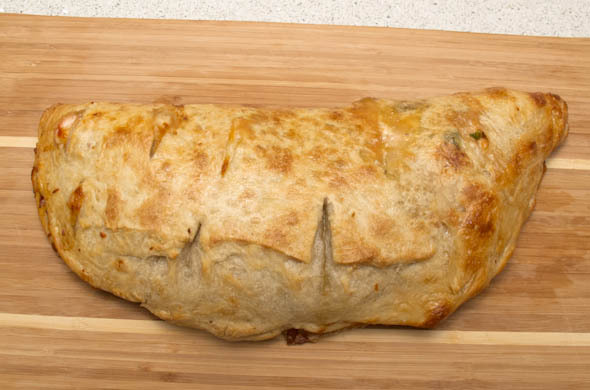 This calzone isn’t such a far cry from my sausage and peppers calzone or from my meatball and spinach calzone but I think some of the best calzones are really the most successful. I like the mix of flavors and textures. 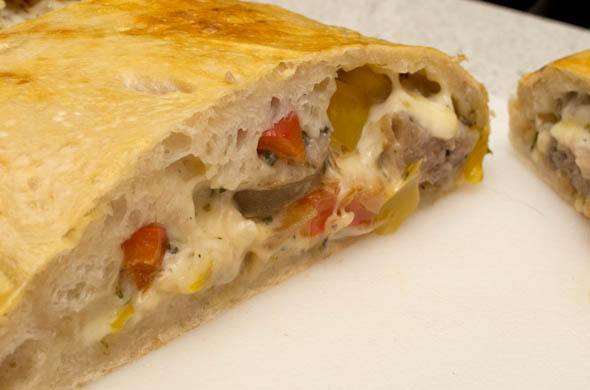 Turkey meatballs have rent-controlled residence in my freezer and make a great calzone filling. 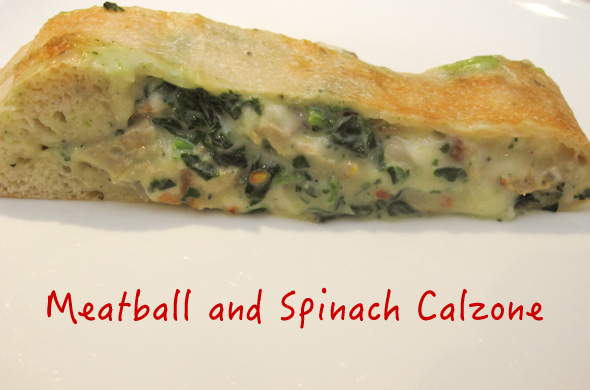 Not all turkey meatballs are created equal. Trader Joe’s has, hands down, the best ones out there. 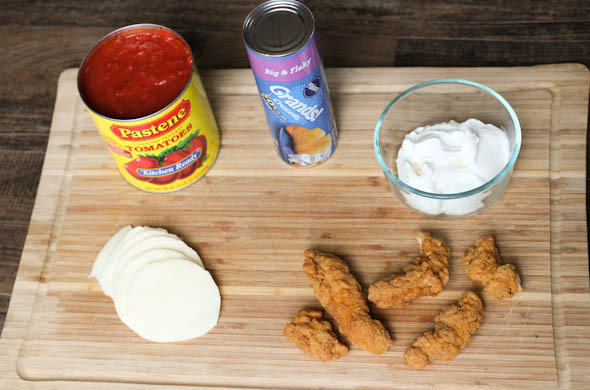 Perdue Turkey Meatballs are terrible…though this wouldn’t be the worst way to use ‘em up. Cooked Perfect are pretty good. I’d definitely try Butterball’s turkey meatballs but I haven’t seen them in passing. I’ve made turkey meatballs myself but I think I like the ground chicken meatballs I’ve made better. 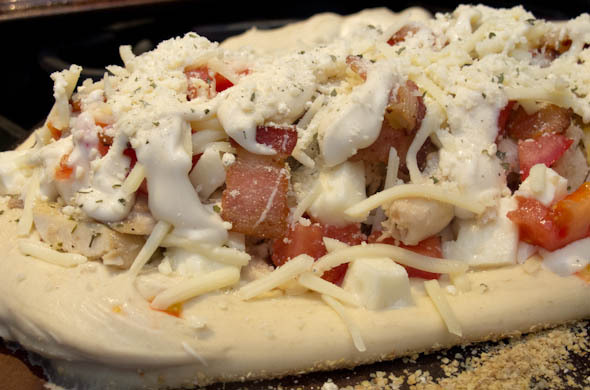 Preheat the oven, and a pizza stone if using one, to 375 degrees. 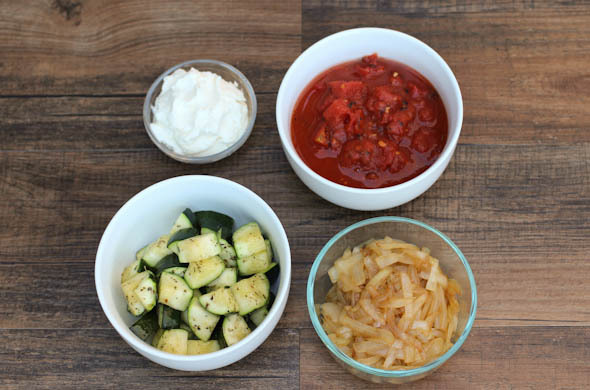 Slice the meatballs into disks, the pepper into strips, and the onion into strips. Saute the onions in a tsp of olive oil until tender, and starting to get translucent, about 4 minutes. Add in the peppers, cook for another 5 minutes until everything is cooked through but still has some texture. 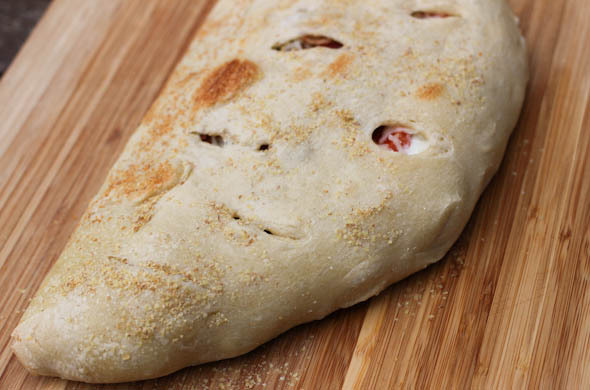 Spread the pizza dough onto the pizza stone or onto a baking sheet. 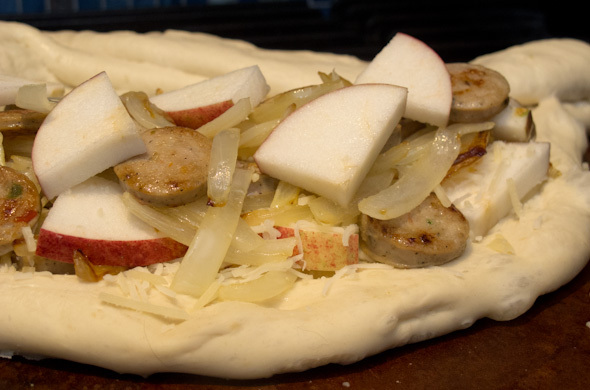 Lay the dough out onto the pan off center, so you’re adding the fillings to what will be the bottom, and you’ll be folding over the top. 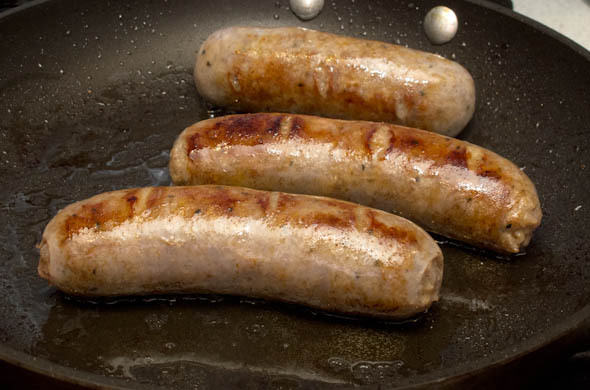 You won’t be repositioning it on the pan again. 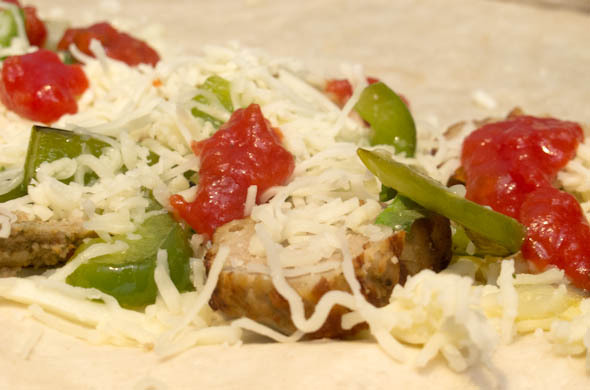 Add the fillings in layers: cheese, peppers & onions, meatball disks, and a drizzle of tomato sauce. Repeat the layers filling and adding what seems like over-filling. 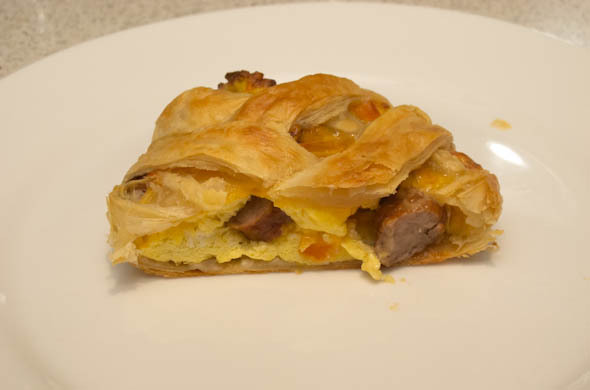 Fold the top over across the filling. Pinch it closed, and slice some vents across the top. 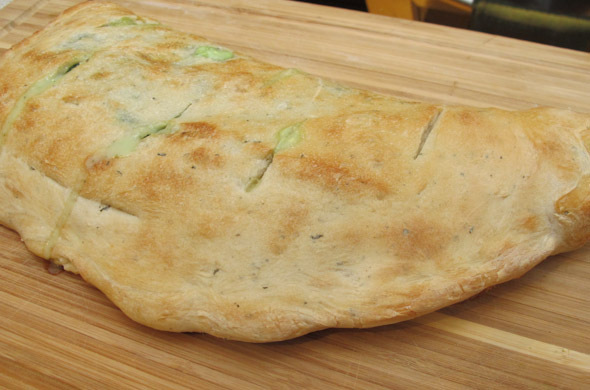 Bake 20 minutes, then brush with eggwash or olive oil. Bake another 10 until golden brown. Let sit 5 minutes before slicing. (I cut it too soon, and look what happens). It was so good. I loved the tradtional-ish flavors. Sometimes I go for out-there flavors but that made me appreciate what works together. The turkey meatballs being fully cooked helped speed this along. I tried to be careful to cook the onions enough before adding the peppers so they could cook evenly. 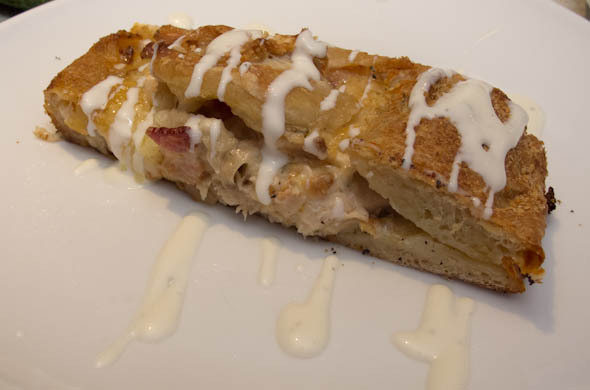 One of my favorite pizza places is Portland Pie Company. I love seeing what their seasonal menu offers. I spotted a reuben inspired sandwich and thought I could vegetarian-ize it to skip the corned beef. 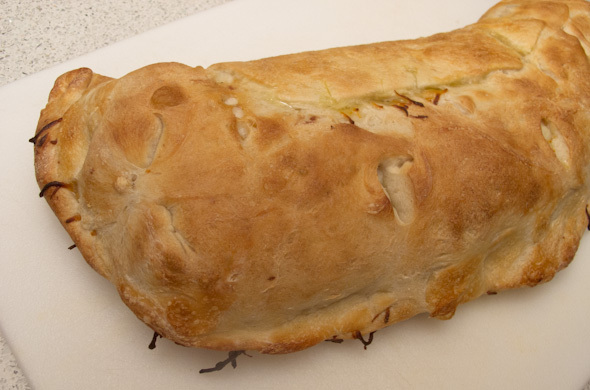 I made it into a calzone and it was totally different than any others I’ve made. 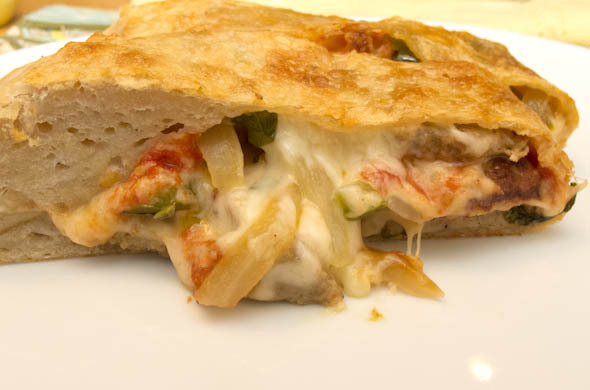 It has cabbage, peppers, swiss cheese, caramelized onions, and 1000-island dressing. 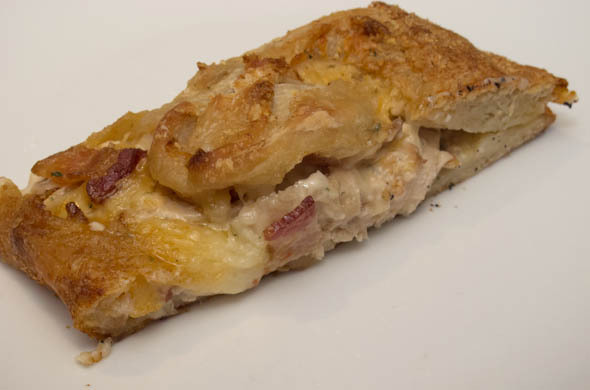 Preheat oven (and pizza stone, if using one) to 400-degrees. 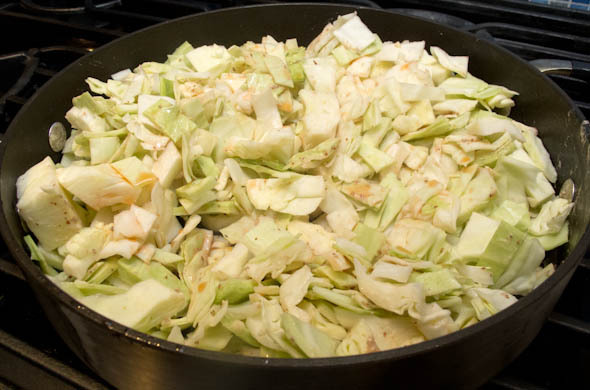 Chop the cabbage into thin slivers. 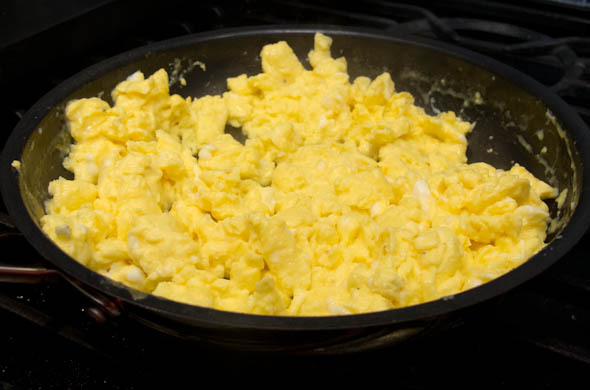 Heat a large skillet to medium heat. Add the mustard and the vinegar, stirring to combine. Add in the cabbage, tossing to combine. 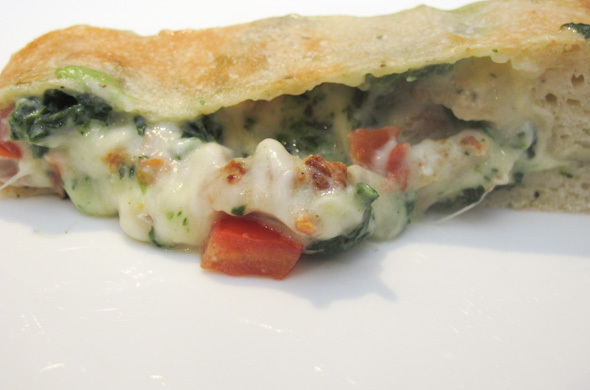 Cook for 5 minutes until softened, then remove from the heat. 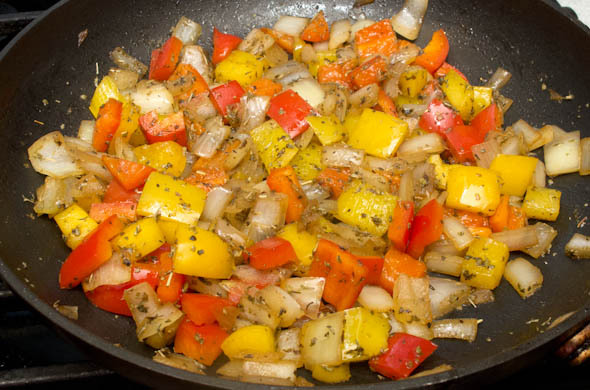 In a small skillet, caramelize the onions over medium heat. 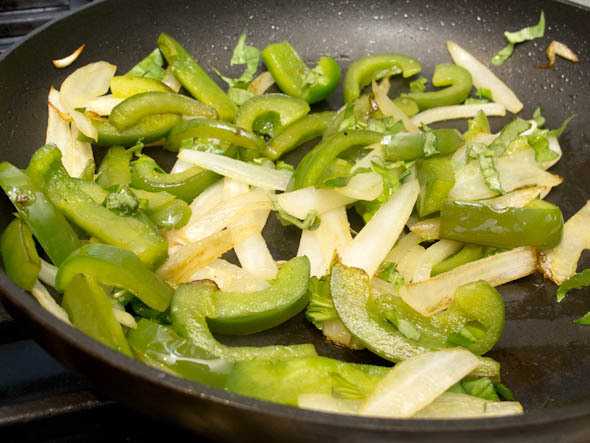 When the onions get tan-colored and caramelized, add the green onion chunks. Cook for 3-5 minutes. 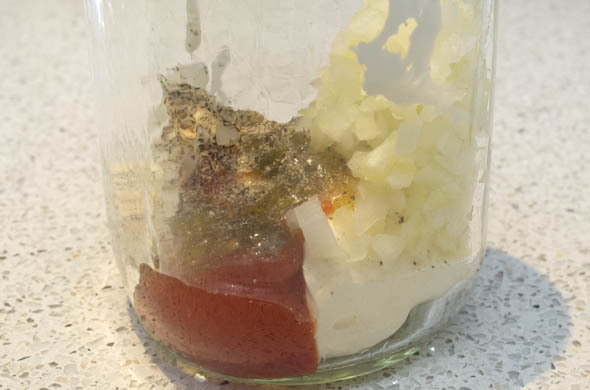 In a small jar, add mayo, ketchup, relish, onion, salt, and black pepper. Shake up the 1000 island jar and taste. 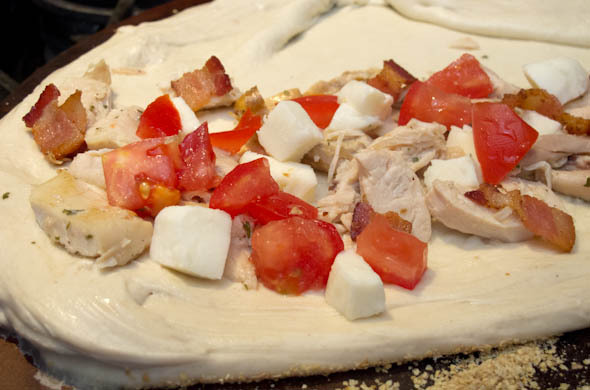 Stretch the pizza dough out into a flat and even circle. 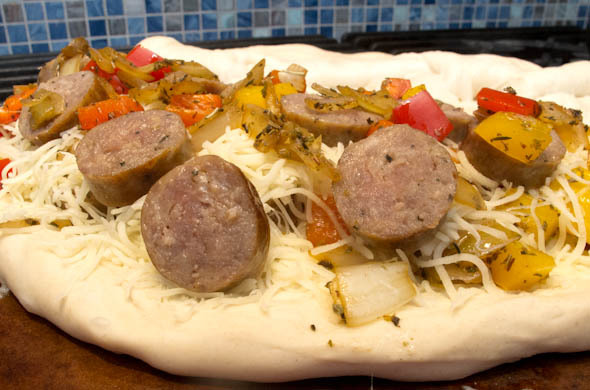 Lay the dough onto a pan or pizza stone so the part of the dough that will become the bottom. 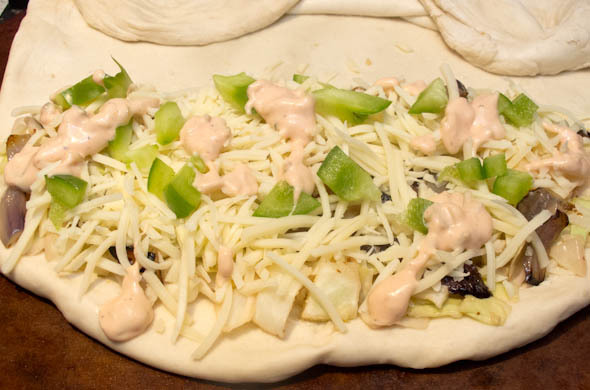 Layer the cabbage, the onions and peppers, swiss cheese, and some teaspoons of 1000 island dressing. 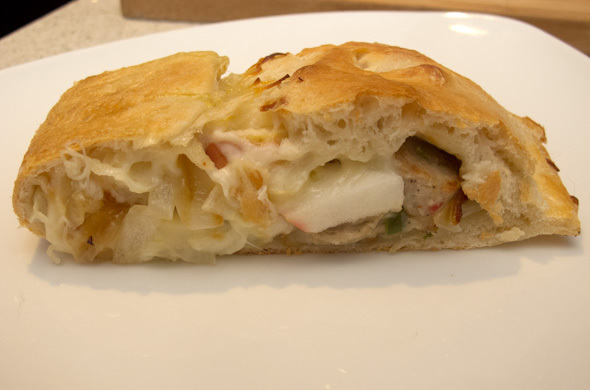 Keep layering all the fillings to fill (and what feels like over-filling) the calzone. 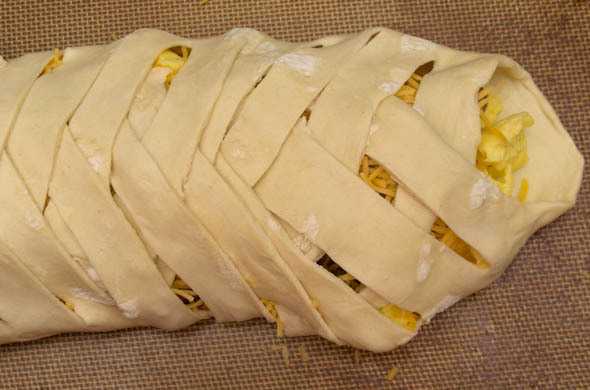 Fold the top over and pinch to close. Cut a few slits in the top to vent. 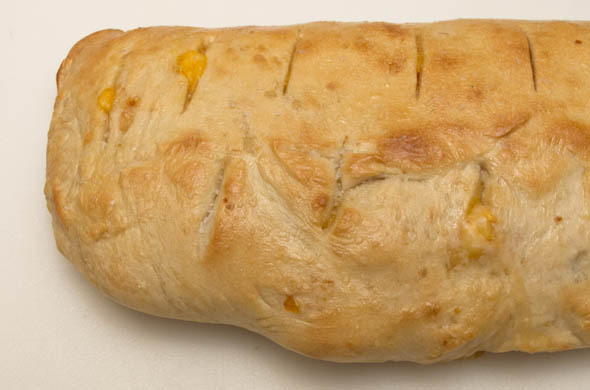 Bake 30-minutes. This was good. Maybe not amazing, but really good. 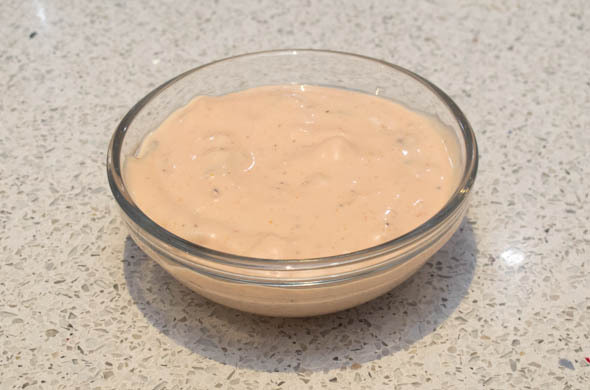 I loved the acid of the vinegar, the light mustard flavor, and the creamy sweet 1000 island dressing. 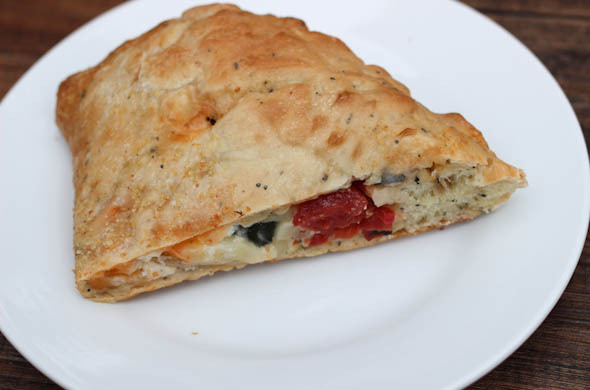 The veggies were crunchy and I liked that the swiss got to shine. I don’t eat corned beef but I can definitely see people liking that. 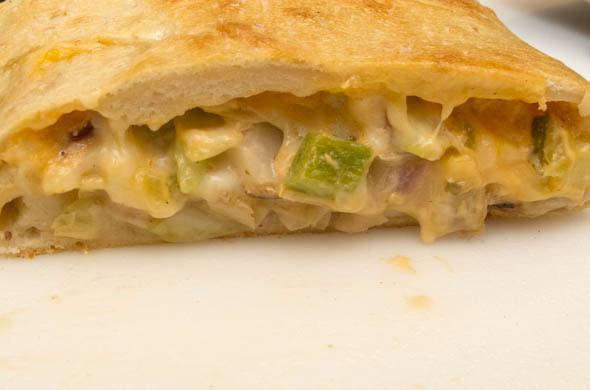 I like the idea of sandwiches as calzones, or pizzas for that matter. 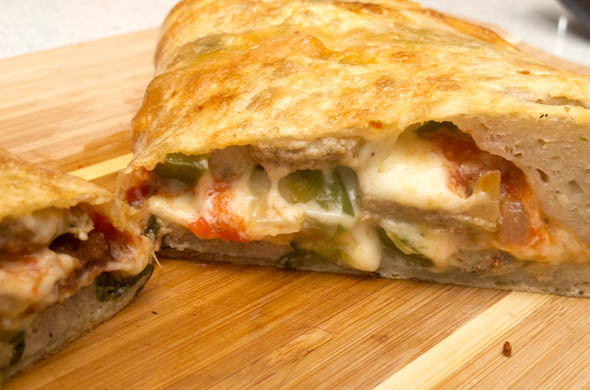 I’ve done a cheeseburger calzone that is sandwich inspired, and a sausage and peppers calzone that is sort of like a sandwich. Hmmm. 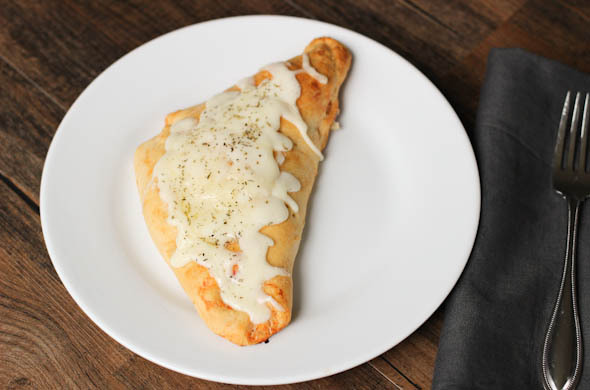 Maybe my next calzone will be along the lines of a sandwich.